Pixel phones are the official flagship Android devices from Google. Unlike other Android phones, which are designed by a variety of phone manufacturers, Pixels are designed by Google to showcase the capabilities of Android. Verizon is the only carrier that sells the Pixel 3 and Pixel 3 XL in the U.S., but you can also buy it directly from Google. The phone is unlocked, so it will work with all major U.S. carriers and Project Fi, which is Google's own cellular phone service. The third iteration of Google's flagship Pixel phone line retains a lot of the same design cues seen in earlier versions. Both handsets feature a similar two-tone color scheme, although the specific colors are different this time around. The Pixel 3 does feel different in the hand from its predecessors, despite the similar looks, as the entire back of the phone is now made of the same soft-touch Corning Gorilla Glass 5 that protects the screen. The rest of the body is made of aluminum. With the switch to a glass-back, both versions of the Pixel 3 also come with built-in wireless charging courtesy of Qi technology. The regular Pixel 3 retains the fairly chunky bezel seen in earlier versions of the Pixel line, and the bigger Pixel 3 XL has a big notch up top in addition to a noticeable chin bezel. The notch does stand out whenever the screen is on, but it houses the phone's two front-facing cameras that Google expects to revolutionize the art of the selfie. The rear camera doesn't represent an upgrade over the Pixel 2 in terms of megapixels, but the Pixel 3 has some built-in learning tricks that help elevate its capabilities beyond what you would normally expect out of its bare hardware specifications. Google Lens: Expanding on one of the flagship features from the Pixel 2, Google Lens is now capable of pulling up information in real time without the need to snap a picture. Playground: Add captions and reactive animated characters to photos and videos. Top Shot: Captures a burst of photographs and uses artificial intelligence (AI) to recommend the best one. Super Res Zoom: Uses AI to let you zoom in on your pictures without them getting blurry. Dual front cameras: Wide angle and normal field of view cameras to help you take group selfies. Adaptive battery: Uses machine learning to waste less battery power on apps you don't use a lot. Wireless charging: Built-in Qi technology lets you charge the Pixel 3 and Pixel 3 XL wirelessly. Call screening: Google Assistant can now screen your calls. Data protection: Both Pixel 3 models include Titan M, which is a custom-built security chip to help secure your phone. Like the original Pixel, the Pixel 2 features metal unibody construction with a glass panel on the rear. Unlike the originals, the Pixel 2 boasts IP67 dust and water resistance, which means that they can survive being submerged in up to three feet of water for 30 minutes. The Pixel 2 processor, a Qualcomm Snapdragon 835, is 27 percent faster and consumes 40 percent less energy than the processor in the original Pixel. Unlike the original Pixel, Google went with two different manufacturers for the Pixel 2 and Pixel 2 XL. That led to rumors that the Pixel 2 XL, manufactured by LG, may feature a bezel-less design. That didn't happen. Despite being manufactured by different companies (HTC and LG), the Pixel 2 and Pixel 2 XL look very similar, and they both continue to sport fairly chunky bezels. Like the original phones in the line, the Pixel 2 XL differs from the Pixel 2 only in terms of screen size and battery capacity. The Pixel 2 has a 5 inch screen and a 2,700 mAH battery, while its larger sibling has a 6 inch screen and a 3,520 mAH battery. 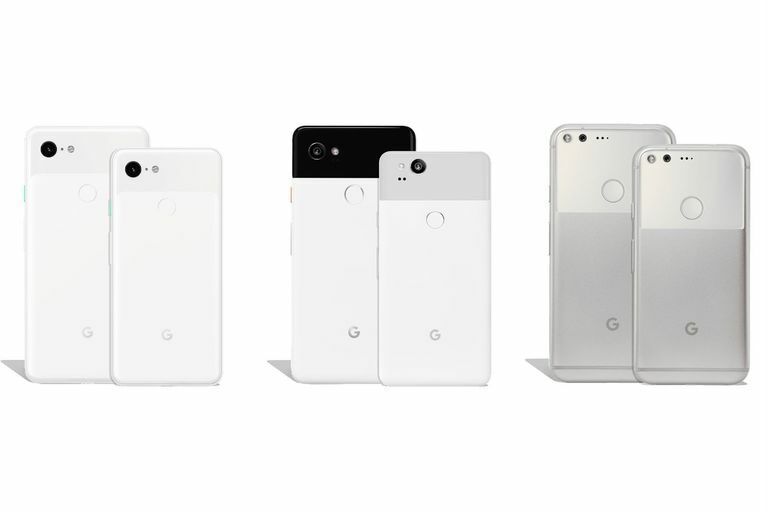 The only real cosmetic difference between the two, other than size, is that the Pixel 2 comes in blue, white and black, while the Pixel 2 XL is available in black and a two-tone black and white scheme. The Pixel 2 includes a USB-C port, but it doesn't have a headphone jack. The USB port supports compatible headphones, and there is also a USB-to-3.5mm adapter available. Active Edge: Squeeze the Pixel 2 or Pixel 2 XL to launch Google Assistant. Google Lens: Point the camera at objects, like landmarks or the text on a movie poster, to pull up relevant information. Now Playing: Listens for music and displays the song and artist without sending or receiving any data. Always-On Display: An always-on feature shows the time, notifications, and other information. Highly rated camera: The rear camera received a rating of 98 from DxOMark, the highest yet for a smartphone. Manufacturing Status: No longer being made. The Pixel and Pixel XL was available from Oct 2016 - Oct 2017. The Pixel marked a sharp deviation in Google’s previous smartphone hardware strategy. Earlier phones in the Nexus line were meant to serve as flagship reference devices for other manufacturers, and they were always branded with the name of the manufacturer that actually built the phone. For instance, the Nexus 5X was manufactured by LG, and it bore an LG badge alongside the Nexus name. The Pixel, although manufactured by HTC, does not bear the HTC name. In fact, Huawei lost the contract to manufacture the Pixel and Pixel XL when it insisted on dual-branding the Pixel in the same manner as earlier Nexus phones. Google also moved away from the budget market with the introduction of its new flagship Pixel phones. Whereas the Nexus 5X was a budget-priced phone, in comparison to the premium Nexus 6P, both the Pixel and Pixel XL came with premium price tags. The display of the Pixel XL was both larger and higher resolution than the Pixel, resulting in a higher pixel density. The Pixel featured a density of 441 ppi, while the Pixel XL featured a density of 534 ppi. These numbers were better than Apple’s Retina HD Display and are comparable to the Super Retina HD Display introduced with the iPhone X. The Pixel XL came with a 3,450 mAH battery, which offered a larger capacity than the 2,770 mAH battery of the smaller Pixel phone. Both the Pixel and Pixel XL featured aluminum construction, glass panels on the rear, 3.5” audio jacks, and USB C ports with support for USB 3.0. Manufacturing Status: No longer being made. 5X was available from September 2015 - October 2016. 6P was available from September 2015 - October 2016. While the Nexus 5X and 6P weren’t Pixels, they were the direct predecessors to the Google Pixel line. Like other phones in the Nexus line, they were both co-branded with the name of the manufacturer that actually built the phone. In the case of the Nexus 5X, that was LG, and in the case of the 6P it was Huawei. The Nexus 5X was the direct predecessor to the Pixel, while the Nexus 6P was the predecessor to the Pixel XL. The 6P came with a larger AMOLED screen and also featured an all metal body. Android Sensor Hub was also introduced with these two phones. This is feature that uses a low power secondary processor to monitor data from the accelerometer, gyroscope and fingerprint reader. This allows the phone to display basic notifications when movement is sensed, and power is conserved by not turning on the main processor until necessary.